A lot of investors are looking for the U.S. dollar to go down, with the Federal Reserve being more or less on the sidelines, but it just keeps staying very firm and refuses to decline. If one were to look at the Broad U.S. Trade-Weighted Dollar Index, one would see that the dollar is near all-time highs of just under 130 (the latest close, as reported by the St. Louis Fed, is 127.48). This resilience in the dollar has happened as the Federal Reserve is not officially done tightening. The trade deal's impact on the dollar and other currencies. A lot of investors are looking for the U.S. dollar to go down, with the Federal Reserve being more or less on the sidelines, but it just keeps staying very firm and refuses to decline. Most investors look at the U.S. Dollar Index, which frankly is outdated. The U.S. Dollar Index is not trade-weighted and it does not include major emerging markets, where the majority of global growth has happened in the last 20 years. If one were to look at the Broad U.S. Trade-Weighted Dollar Index, one would see that the dollar is near all-time highs of just under 130 (the latest close, as reported by the St. Louis Fed, is 127.48). 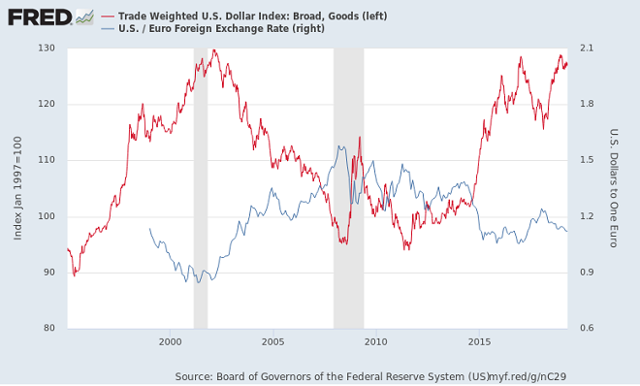 If one wanted to use the euro as a proxy of the old U.S. Dollar Index, since it's the heaviest component (with over 57% weighting), one could say that the dollar today, on a trade-weighted basis, is where the euro was back in 2001, when it hit 83 cents. For comparisons, the euro closed last Friday at $1.13. This resilience in the dollar has happened as the Federal Reserve is not officially done tightening. The runoff of bonds from its balance sheet continues, even though the Fed Chairman himself has stated that for the time being the fed funds rate hikes are on hold. Keep in mind that the only other major reserve currency - the euro - is under full "QE assault" from the ECB. Short-term policy rates in Europe are negative while the ECB balance sheet has resumed growing. This is bound to put further pressure on the euro, particularly if this belated fits-and-starts ECB brand of QE continues to be ineffective. Euro parity to the dollar under such a scenario is only a matter of time, particularly if the delayed Brexit does not happen smoothly. The biggest trade deal is the one with China, which is 90% done as per the Trump Administration's own admission. I have long maintained here that the Chinese had every incentive to make a trade deal with the U.S., as the lack of such a deal would complicate their domestic situation tremendously at a time when the Chinese economy was slowing down under heavy debt loads and government sponsored deleveraging. The Chinese previously had taken advantage of the United States by directing their army of state buyers to buy more from their key trading partners in the region so that they can increase their political influence. There are plenty of things the Chinese could have bought from the U.S. in the last 15 years, but they didn't. It took an unconventional man like President Trump to arrest their clever trade strategy - worthy of true Sun Tzu disciples. If the U.S. trade deficit begins to shrink notably, courtesy of aggressive Trump trade policies, this is decidedly dollar-bullish, and it would have a long-term impact on currency markets. 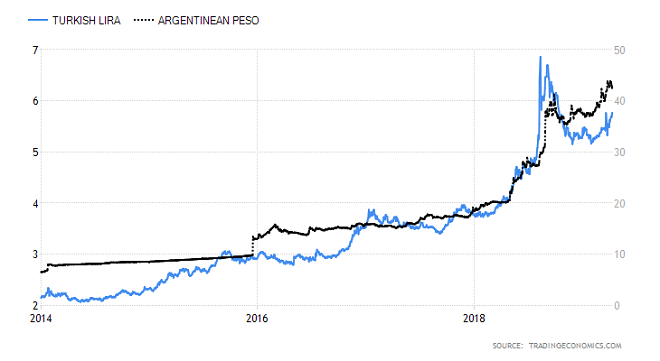 Finally, there are a number of emerging market currencies that are in a very precarious situation, namely the Argentine peso and the Turkish lira. Both depreciated dramatically in 2018 and have again come under pressure. This month, the Argentine peso made an all-time low near 44 to the dollar, while Turkish 5-year credit default swaps began to blow out, suggesting that institutional investors may be positioning themselves for a further Turkish devaluation and/or default. Currency crises and defaults in one or both of those countries cannot be ruled out at a time when the global economy is much weaker outside of the United States and both have inadequate foreign exchange reserves to maintain their exchange rates. Turkey, Argentina, and China were singled out in May of last year as the most likely places to see exchange rate and/or sovereign debt trouble. Given what has happened in Argentina and Turkey so far, they have seen a lot of trouble since then and it is likely that they will see more trouble in 2019. China has been relatively calm as - yet again, to my disbelief - they arrested their economic decline with their infamous lending quotas and aggressive government intervention, the likes of which the world has never seen in an economy of China's size. If there were to be a second Asian Crisis (similar to 1997-98) because of China's credit bubble, it likely won't be this year. Still, this is precisely where China is headed with its massive indebtedness and extreme government intervention in the economy, which results in GDP growth but no commensurate growth in aggregate profits. As to Turkey and Argentina, I think there is a lot more bad news to come, which should put upward pressure on the U.S. dollar and downward pressure on Treasury yields in their capacity as safe haven.